152113. 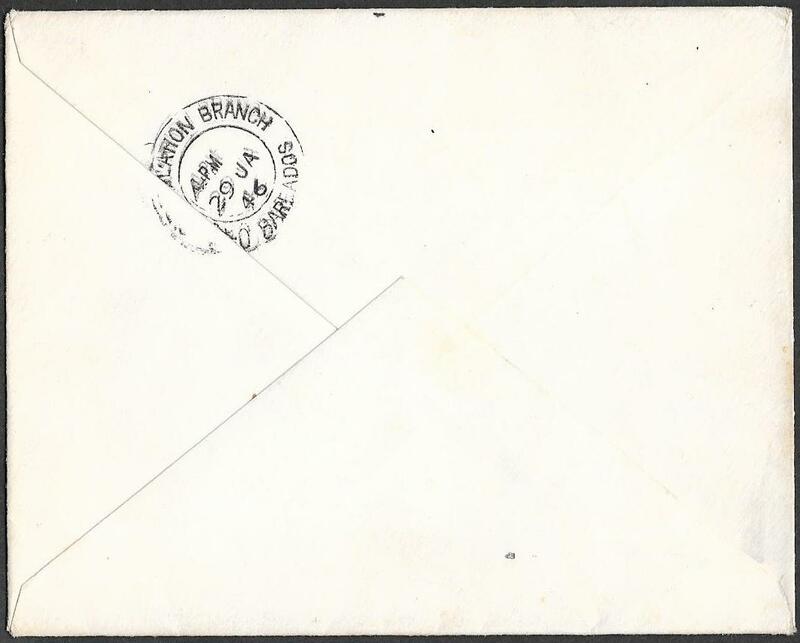 1/2d SG197 and 2d SG200( fault bottom left corner), on a very clean envelope to PARIS from the Exhibition. considerately applied between the Exhibition cancellations. On the reverse is a Paris Distribution cds for this same date. An attractive item and scarce to an overseas destination from this Exhibition. NB: the 2d is close to or at SG199; the scan does not do justice to the very fine green colour. 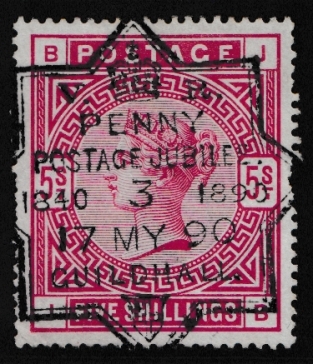 fine example, a few corner wrinkles, initially struck with the Rubber Handstamp with no fixed date and no code. It seems that this handstamp was specially used on items cancelled by favour and were not intended for posting. 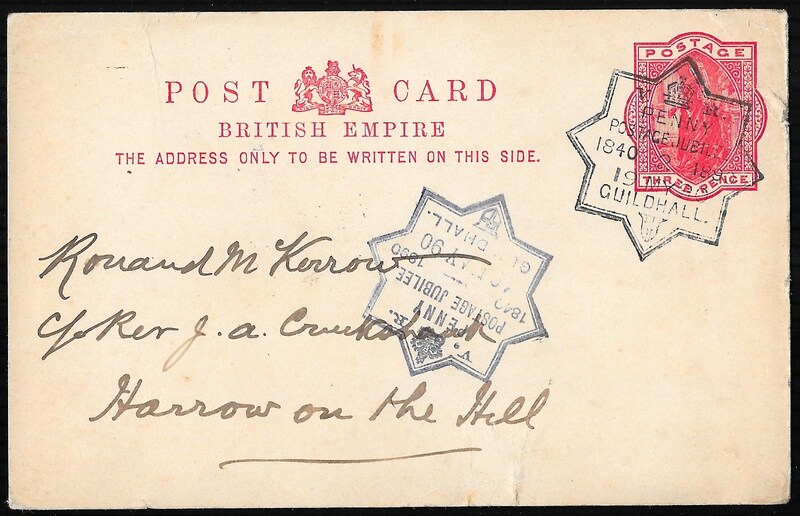 This card was then addressed over this handstamp to Harrow Hill and posted. It received a superb strike of the Metal Handstamp which had changeable slugs for the date and the time code. 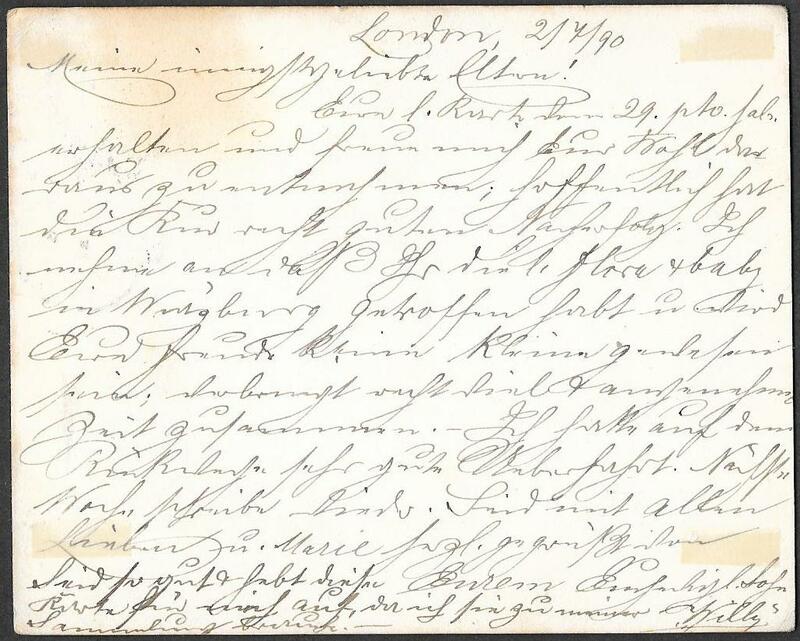 This example has code 2, probably 2pm, and May 19th 1890 - the last day of the EXhibition. we have seen on the 3d Empire card used at the EXhibition. 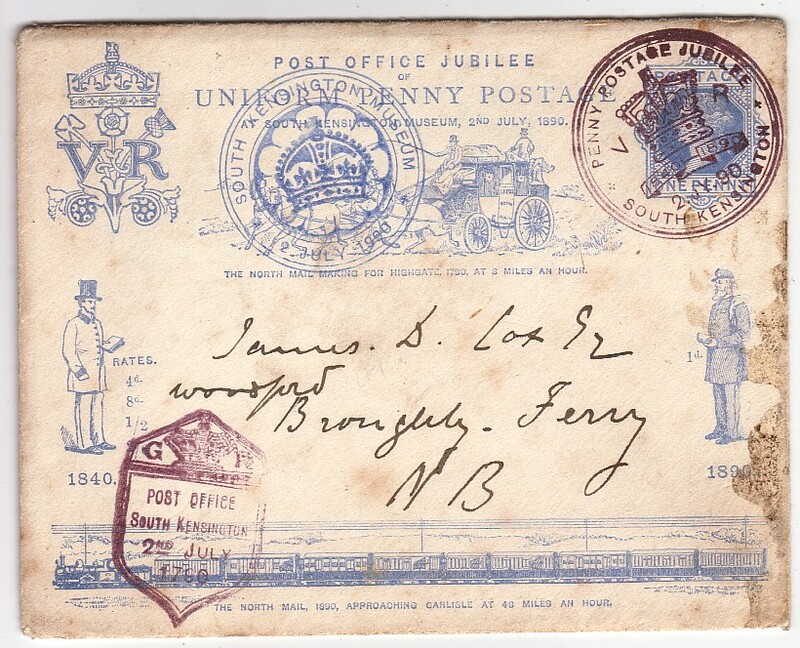 NB: the postcard is in better condition than the scan suggests. See item 152107 for the 3d card used to Australia. 152100. 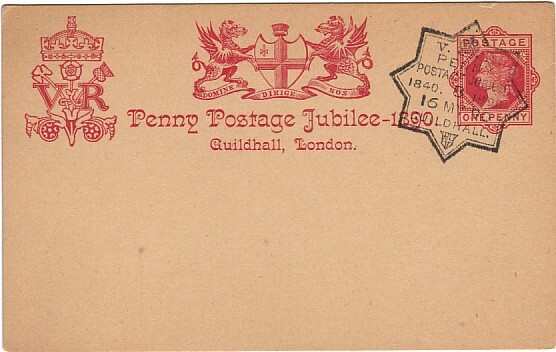 Insert of the Penny Post Jubilee Envelope used on the Day of Issue, July 2nd 1890, and sent to Germany from London. 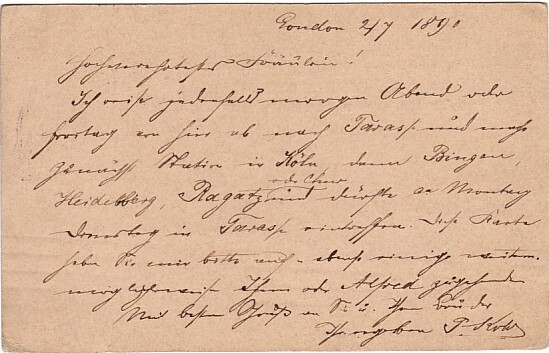 The message is in German and dated July 2nd 1890.
used on this date and especially so to an overseas destination. NB: The areas of browning on the front and reverse are fainter than in the scan. Bardbados date stamp on reverse for January 29th 1846. The envelope was readdressed to Hastings and has been surcharged as Liable to Letter Rate. 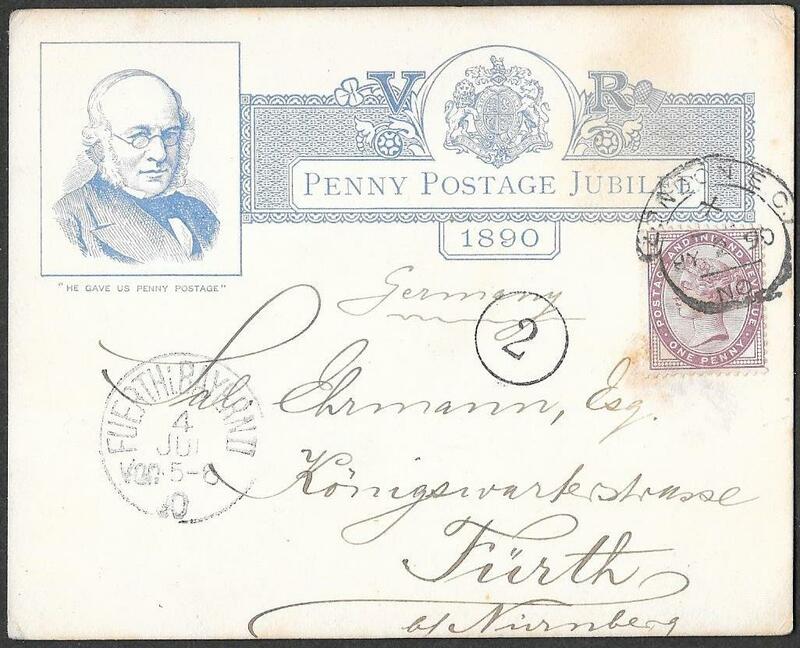 One of the latest usages of this 1890 envelope we have seen: it became invalid for postal use in 1915. Very Rare used Furniss Caricature: redirected on CHRISTMAS DAY. with a London date stamp for 8:30 pm December 25th. The insert carries a Christmas Greeting. Few used examples are known of this attractive caricature. the ONLY ONE known with a Christmas Day cancellation. and finer than the scan. 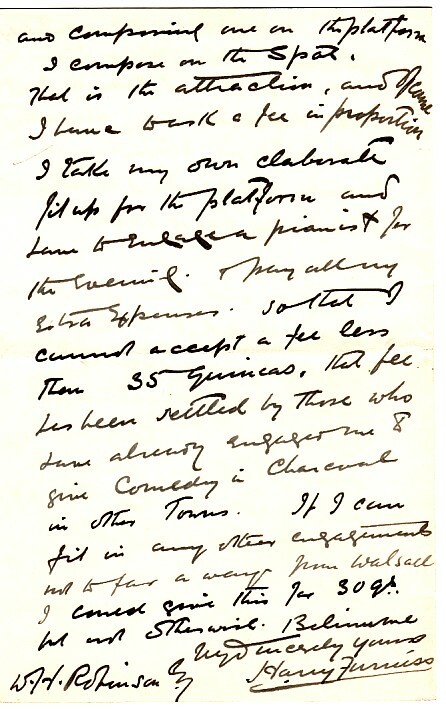 following season and discussing terms, London May 12th 1902.
for which Furniss was asking 35 guineas: read the part transcription. The letter itself is relatively easy to read. 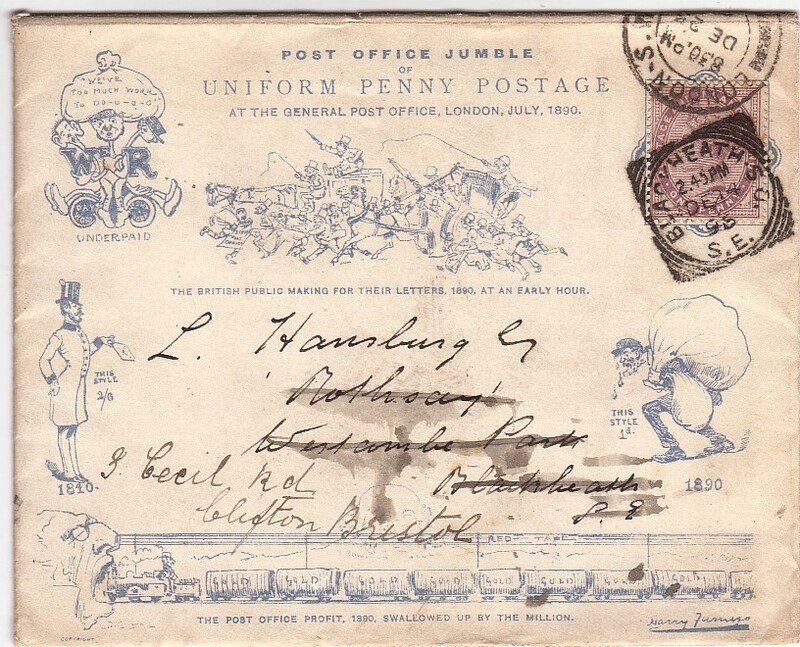 who lampooned the July 2nd 1890 official Penny Post Jubilee Envelope. Elliott Caricature: the finest example extant? poor quality paper and with the insert on similar thin paper. 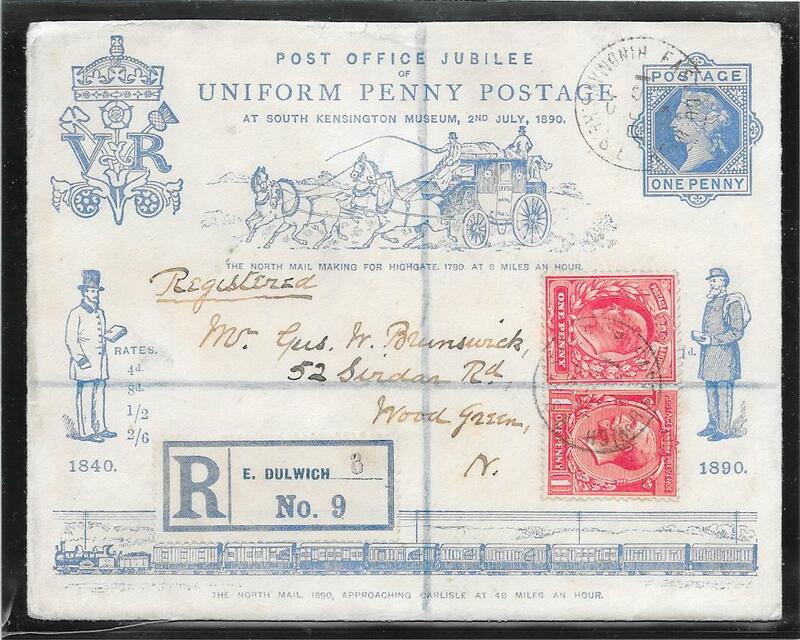 This example is in truly exceptional condition no age marks on the envelope or insert. 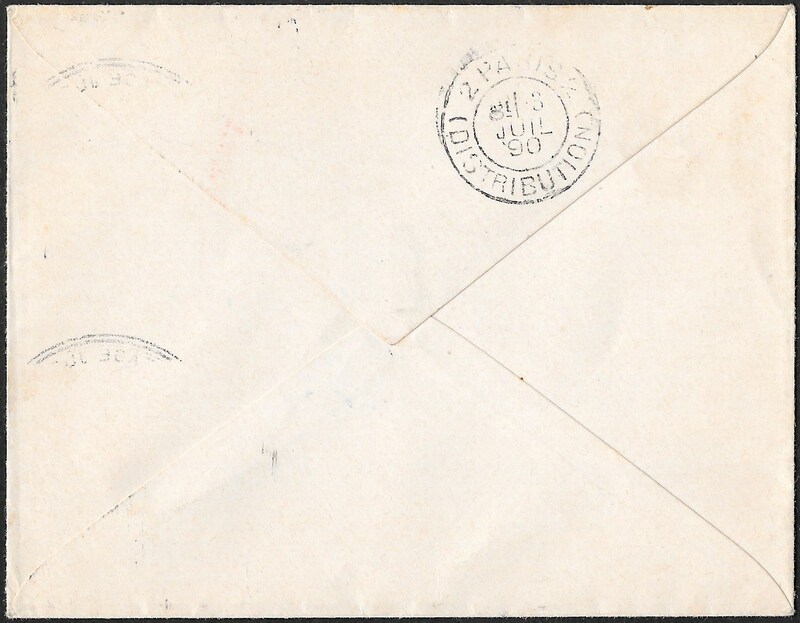 Usually these envelopes are found with a lot of age spotting because of the poor quality paper used. The envelope has been partially slit open at both sides in order to extract the insert. Post Office forced them to be withdrawn from sale under the Post Office Protection Act of 1884.
it is hard to see how a better example could have survived. Extremely RARE: 3d Empire Card sent to AUSTRALIA from the Exhibition. with an interesting message on the reverse together with a Melbourne receiving cds. Some wrinkling at right but this is an exceptional item. only 1,208 were of a type for the foreign service and only some 12 were addressed to Australia . and of these only 311 were sold as were used for the foreign service. will have been extremely small and very possibly less than the twelve sent from the May 1890 event. Interesting message on the card written at the Exhibition. An exceptionally rare item of Exhibition importance. Rare: 3d Empire Card sent to Germany from the Exhibition. 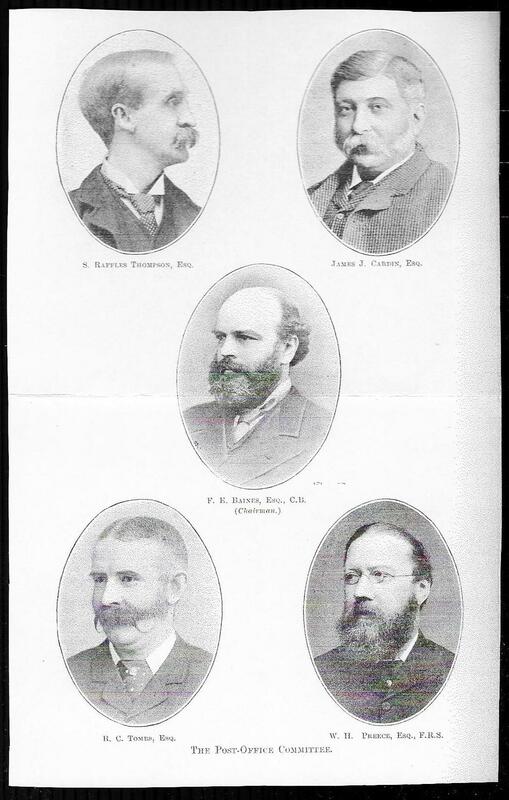 from the July 2nd 1890 Penny Post Jubilee Exhibition. only 311 were of the type for the foreign service. and this is only the third we have seen. 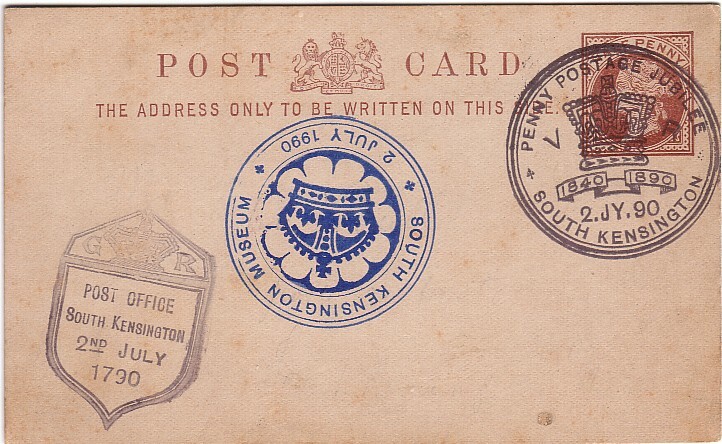 Post Office Eddystone Lighthouse Exhibition date stamp. Sittingbourne cds on reverse for July 28th 1890. 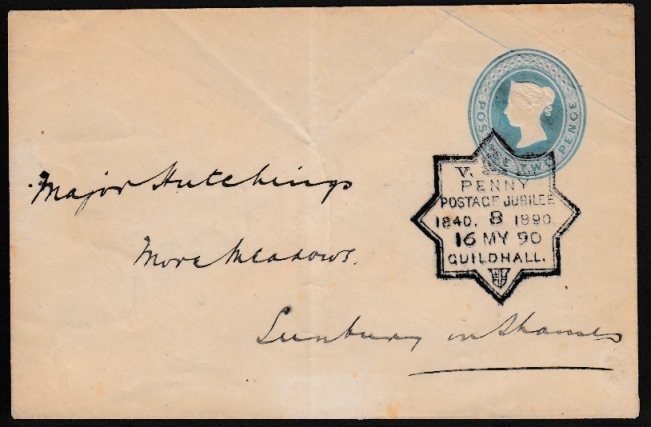 Corner clipped but a superb item with the Exhibition cancellations upright and not overlapping. 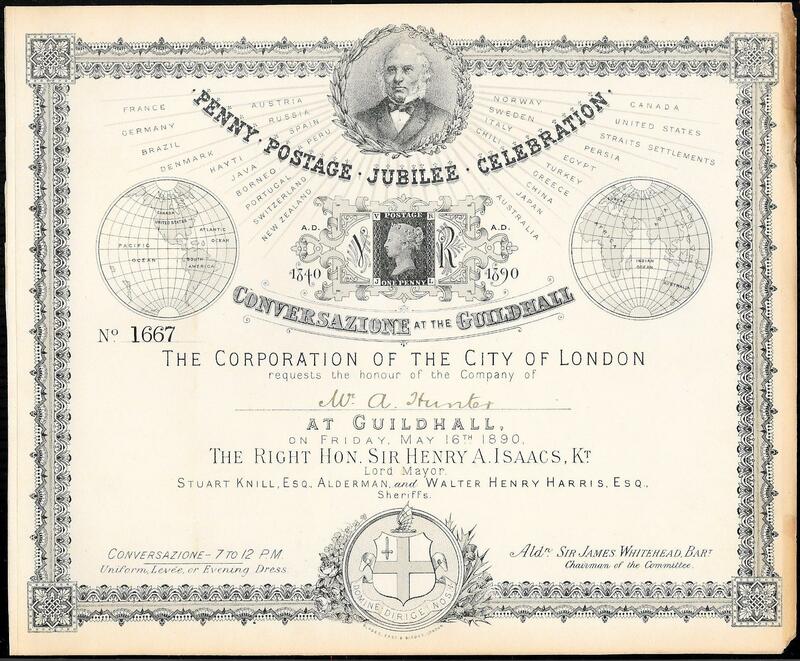 Registered on the day of issue, July 2nd 1890, and used locally within London. London Registered Ovals for this date with the Registration Fee paid by a 2d SG200. The 2d has a small nick in the bottom perfs and a surface abrasion at the right mainly beneath the cancellation. Only the second such usage of this envelope we have seen - the last one we sold 10 years ago.. In our experience, this item is significantly rarer than items sent registered from the Exhibition itself which numbered 276. Despite the damage to the 2d, this is a rare item. NB: cleaner than it appears in the scan; top flap roughly opened at rear. The green of the 2d is much deeper than the scan suggests. Very Rare Usage of the 1d red imperf at the July 1890 Exhibition. 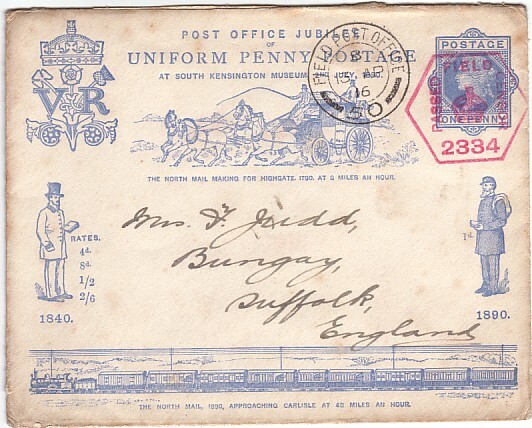 the 1d postage to Southampton has been paid by a an almost full-margined 1d red imperf, Alphabet 1. This has been cancelled by the Special Exhibition Cancellation. 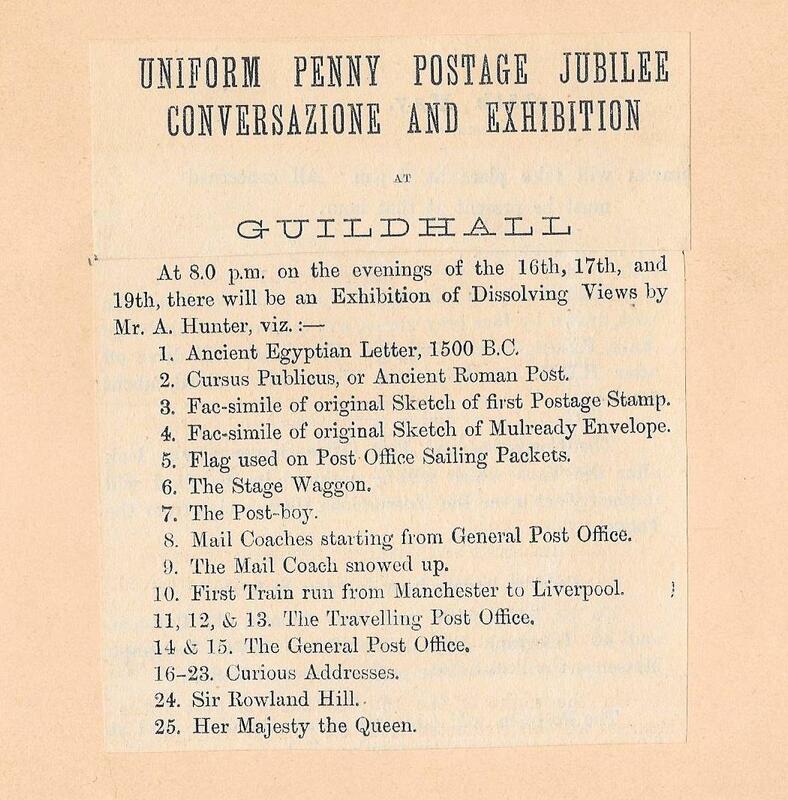 at the July Exhibition though we are aware of a similar usage at the May 1890 Penny Postage Exhibition. NB: Although there are age markings on the envelope they are FAR LESS pronounced than in the scan. Rare Sheet of Proof Impressions May 1890. (moveable date and time code slugs) to be used at the Exhibition to cancel mail that was posted but not for cancelled to favour items. In 'The Penny Postage Jubilee 1890' by Werner Bauschke, the different types of Special Handstamps used at the Exhibition are illustrated. The proof strikes here are S3: numerals and date in heavier type; May 16th 1890 was the first day of the three day Exhibition. the Time Code '12' was therefore never used and only known as proof strikes. Bauschke further notes that NO PROOFS exist in the Post-Office Archives. An enlargement of one of the strikes from the sheet is illustrated above. but the browning on the right hand edge is NOT present - a shadow from the scanner. Overall it is in very fine condition and would make a superb Display Piece. We know of only one other complete sheet with these twelve Proof Strikes. NB: the sheet is NOT mounted on the black card background used for scanning. Used shortly before Invalidated for Postage. 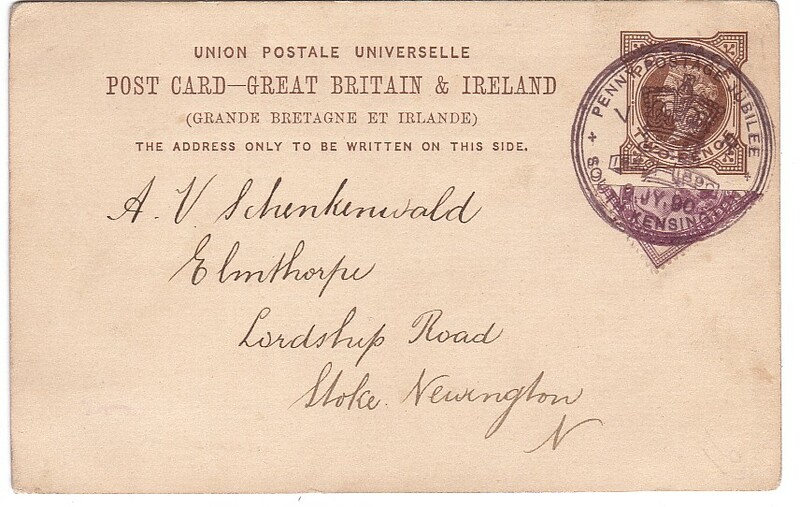 sent Registered within London on June 15th 1915. The 2d egistration fee paid by an Edward V11 1d and a George V 1d. The Insert Card enclosed with the envelope has an interesting message. There are several transit cds's on the reverse for this same date. 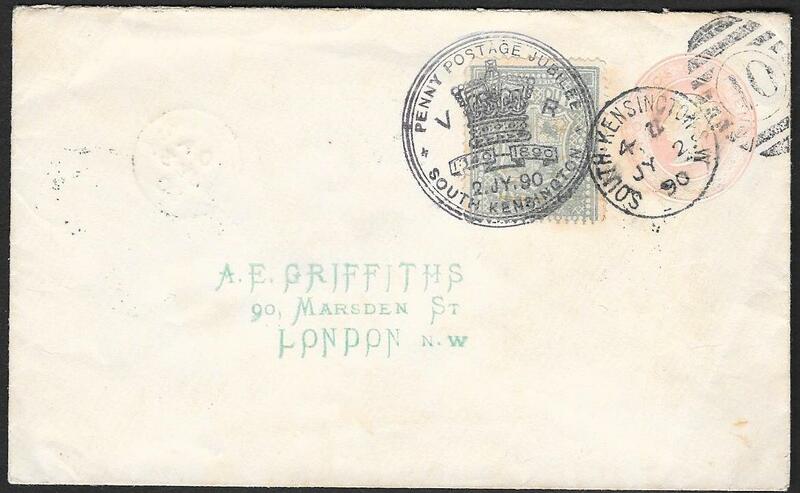 This envelope ceased to be valid for postal use from July 1st 1915.
before the date of invalidation by the Post Office. NB: there is no browning around the address. RARE usage 1d Fiscal of SG F12 at the 1890 Exhibition. with a 1d FISCAL, SGF12; small fault at the top,tied by the Exhibition cancel in blackish violet. Ink. London WC July 3 1890 cds on reverse. Rare Usage: 1d Fiscal SG F20 Die 2.
with a 1d FISCAL SGF20 from the very scarce Die 2 and tied by the Exhibition cancel in blackish violet. 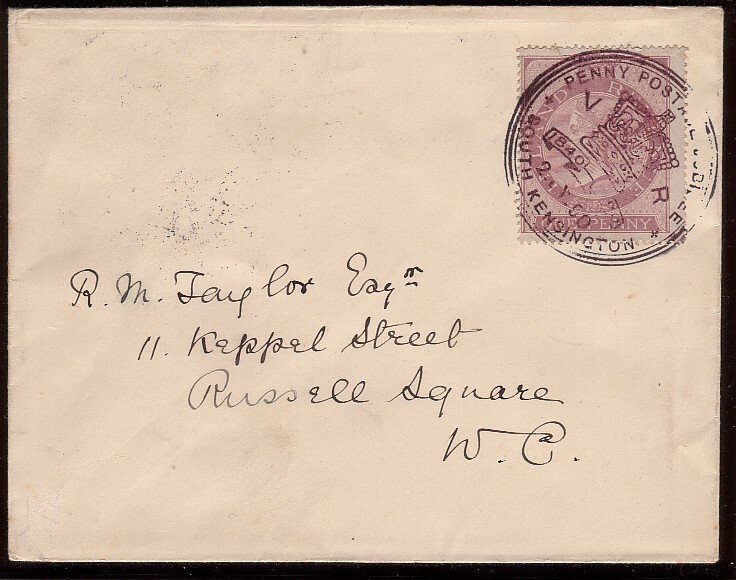 London WC July 3 1890 cds on the reverse. A rare usage of Die 2. Very rare usage during WW1. 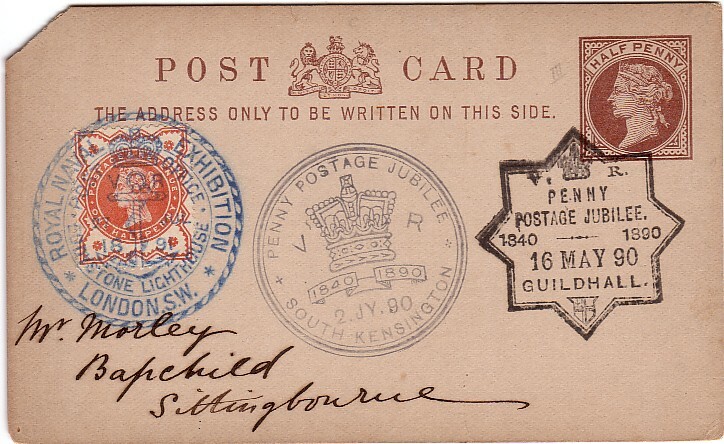 very fine example sent to Bungay, Suffolk, England presumably from a soldier during WW1. QV stamps and related postal items were demonitized on June 30th 1915.
and alongside is a Field Post Office cds for 13th April 1916, ‘50’. There are no Postage Due markings. As the address says ‘England’, quite likely that this was sent from France. 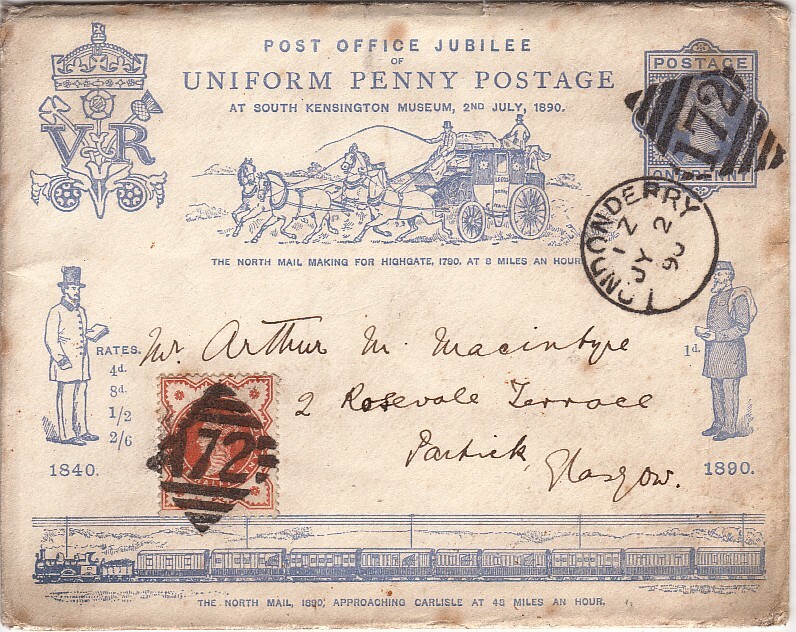 This is the first example of this envelope we have seen with a military usage and appropriate markings. There is no insert as the contents would have been a letter and as expected no markings on the reverse. 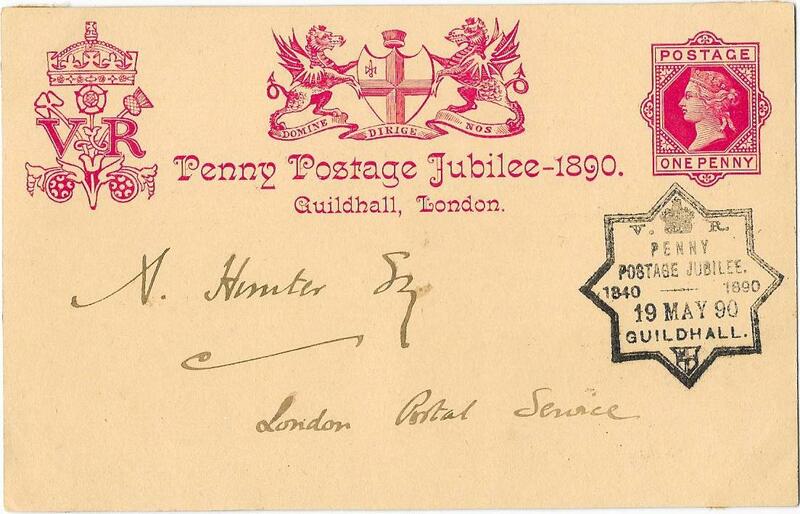 and available from Post Offices on July 2nd 1890.
very fine London E C scroll cancellations for July 2nd 1890. 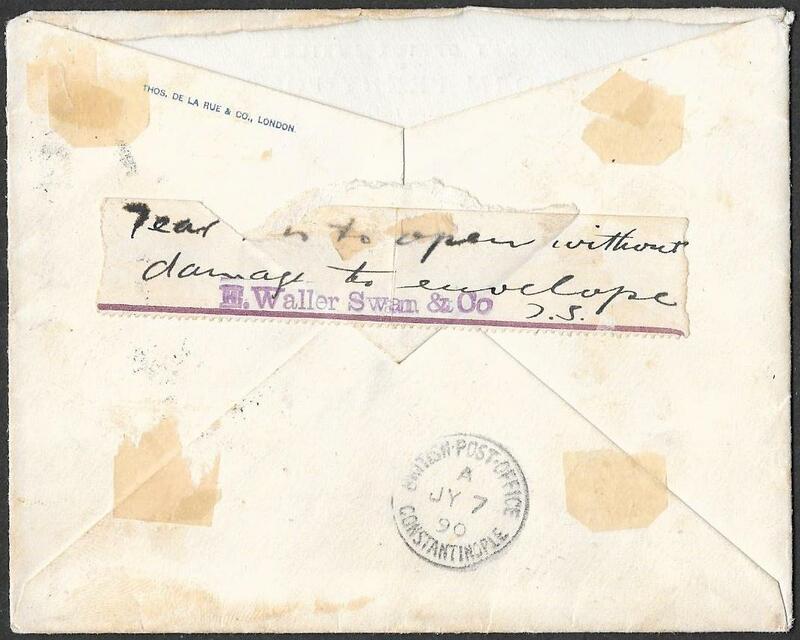 On the reverse, top flap missing, is a British Post Office Constantinople cds for July 7th 1890.
about its design, 'not much to look at' and collectability especially if sent through the post. so one assumes he was very well known there at that time hence his name only. 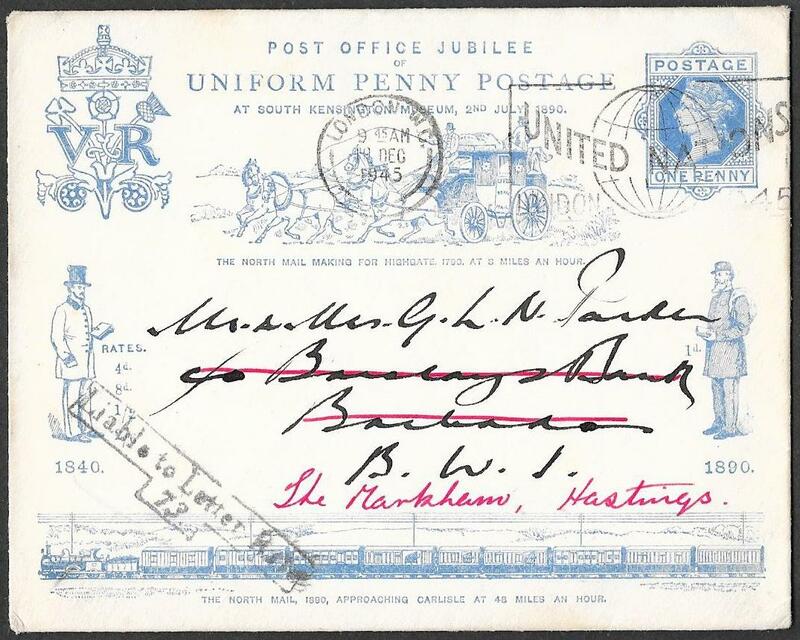 Despite the faults this is the only example of this envelope sent to this destination on its Day of Issue that we have seen. 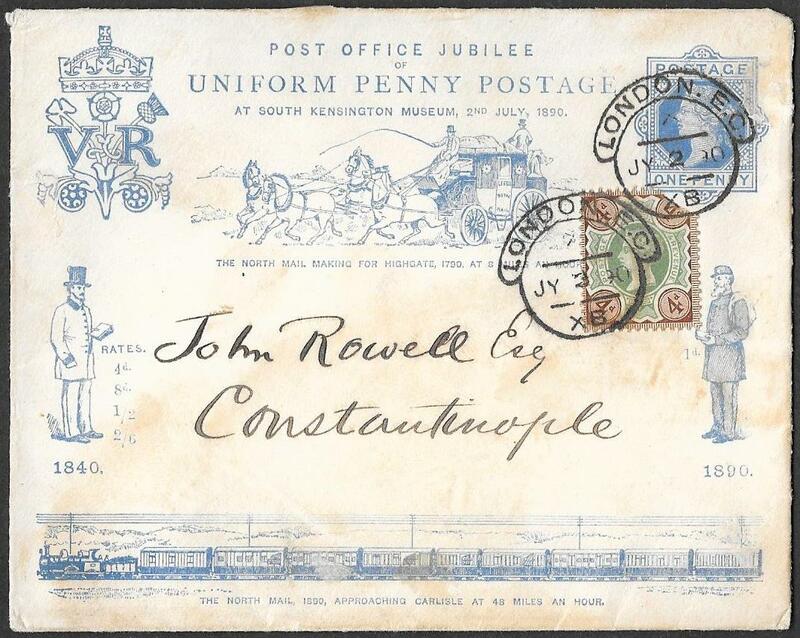 We cannot recall seeing this envelope sent to Constantinople on any date! 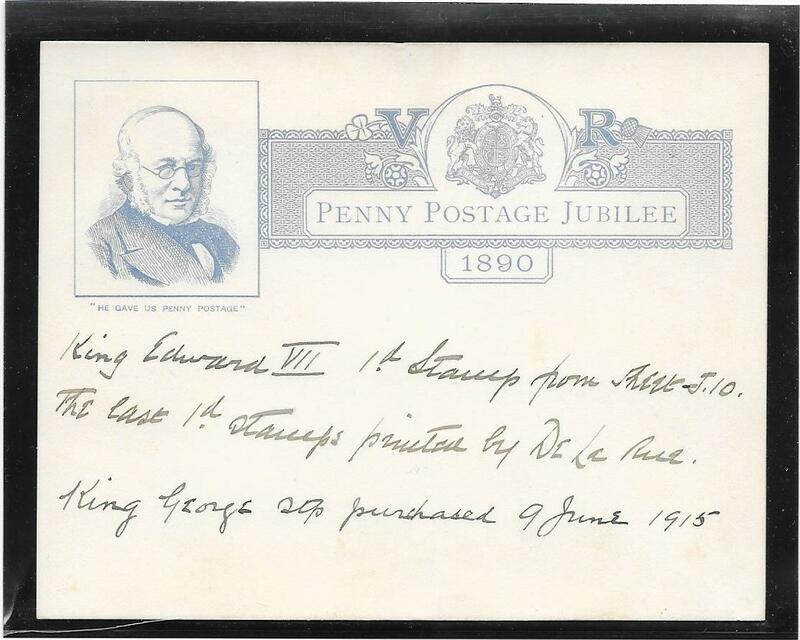 A rarity and even more so with the original letter expressing the commonly held view at that time about its future value. NB: the browning on the front of the envelope is not as pronounced as the scan suggests. The person who opened the envelope did not follow the instructions on the stamp edging. An interesting address and message. 15055. 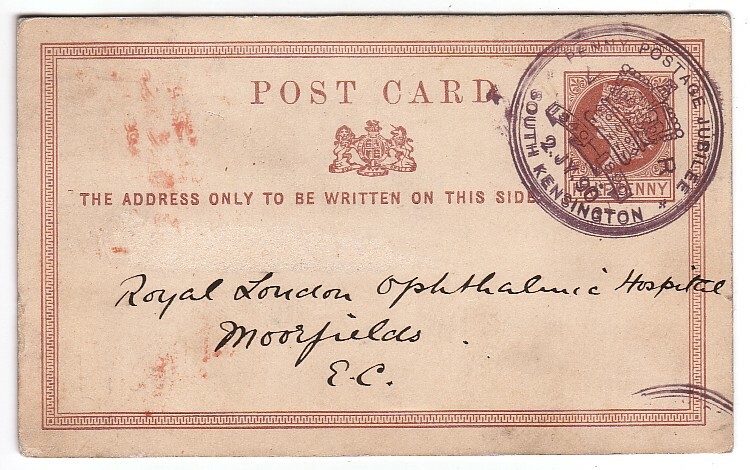 July 2 1890: Fine 1/2d brown postcard sent to Moorfields Eye Hospital from Somerset House. 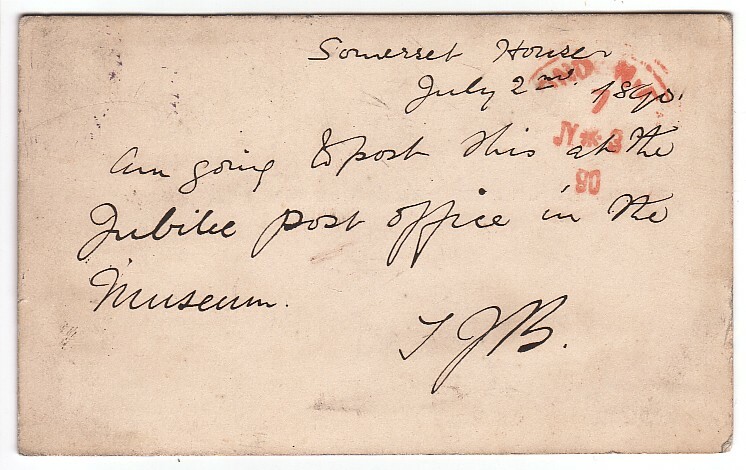 a rare usage of this dater cancellation on an item posted from the Exhibition. 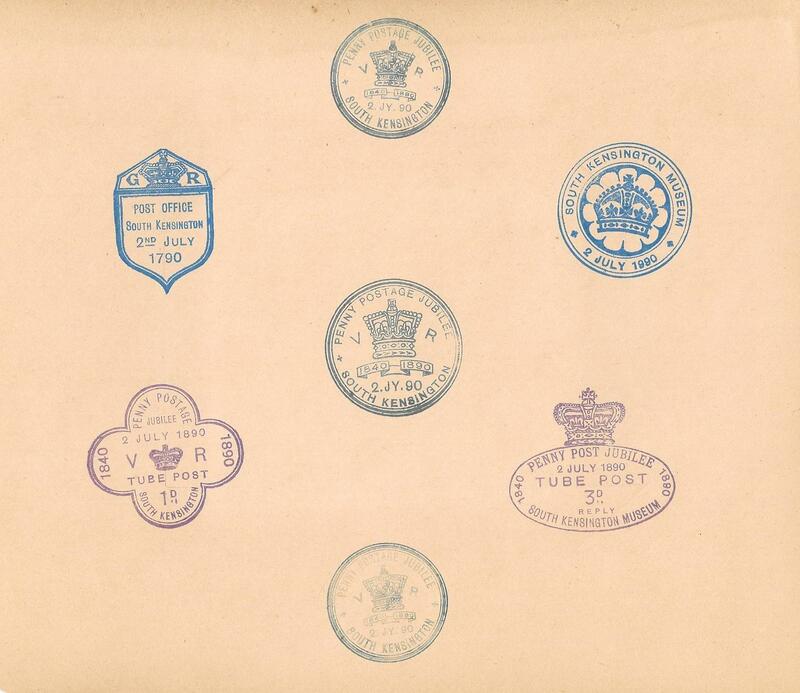 FIVE of the special postmark types used at the event. Three on the front and two on the reverse. ALL SIX Cancellations on the ONE CARD. and three others on the reverse including the scarce smaller Penny Postage Jubilee cds seldom used. SIX of the cancellations used at the Exhibition on the one card. NB: the browning of the envelope is not as deep as the scan. 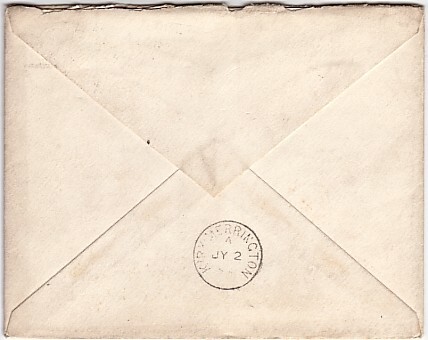 Rare Provincial usage of the Envelope on the DAY of ISSUE. 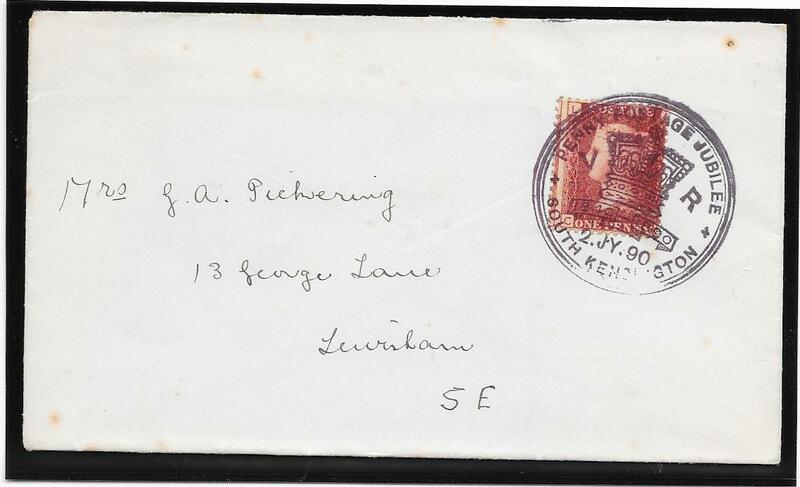 very scarce provincially used example sent from Kirk Merrington to Bishop Auckland on the Day of Issue. 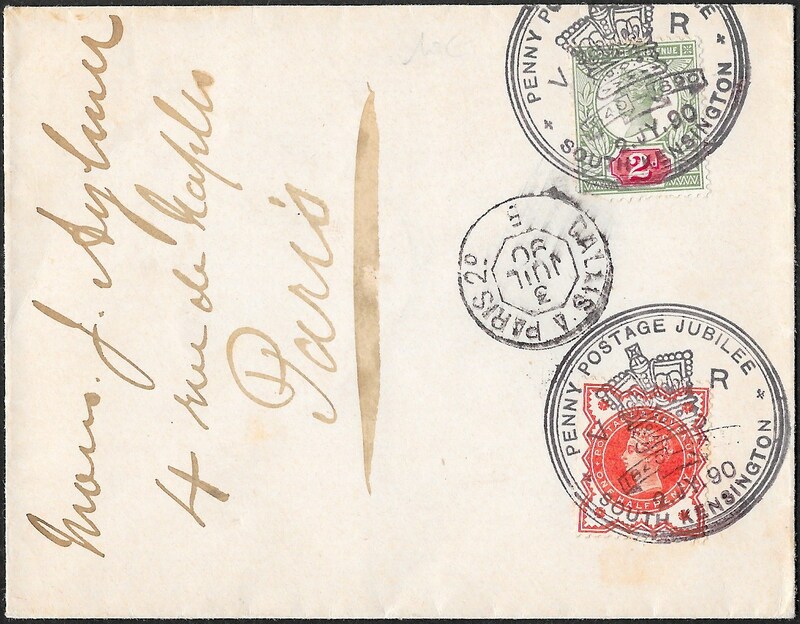 example we have seen used provincially with two Day of Issue date stamps. In the 1891 census, the population of Kirk Merrington was only 2128 souls. A RARE usage at the 1890 Exhibition. 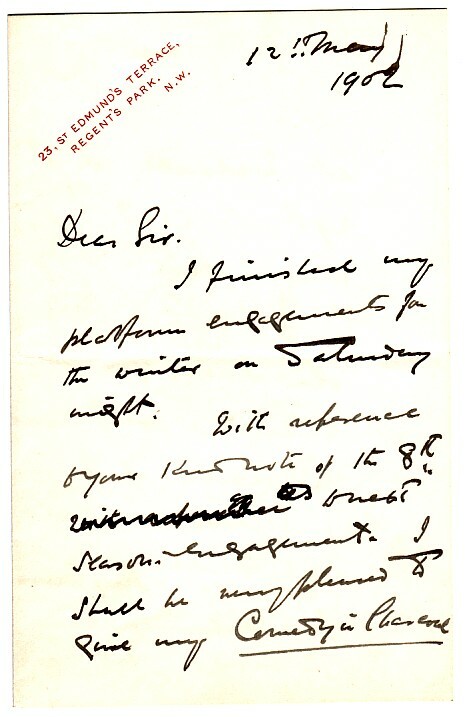 cancelled by a superb and upright July 2nd 1890 Exhibition cancellation. 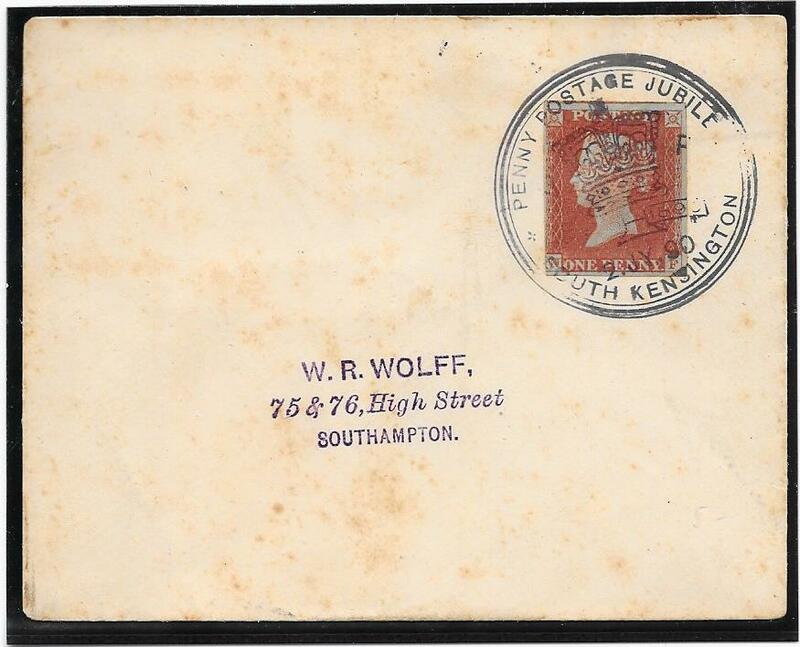 Sent locally in London with a July 3rd 1890 cds on the reverse. We cannot recall seeing another example of this wrapper used in this way. together with various original newspaper cuttings mounted for display. 151595. The very scarce Official Invitation card to the Conversazione at the Guildhall on Friday May 16th 1890. There is some browning on the edges, especially at the top right but the other peripheral browning is much paler than the scan suggests. 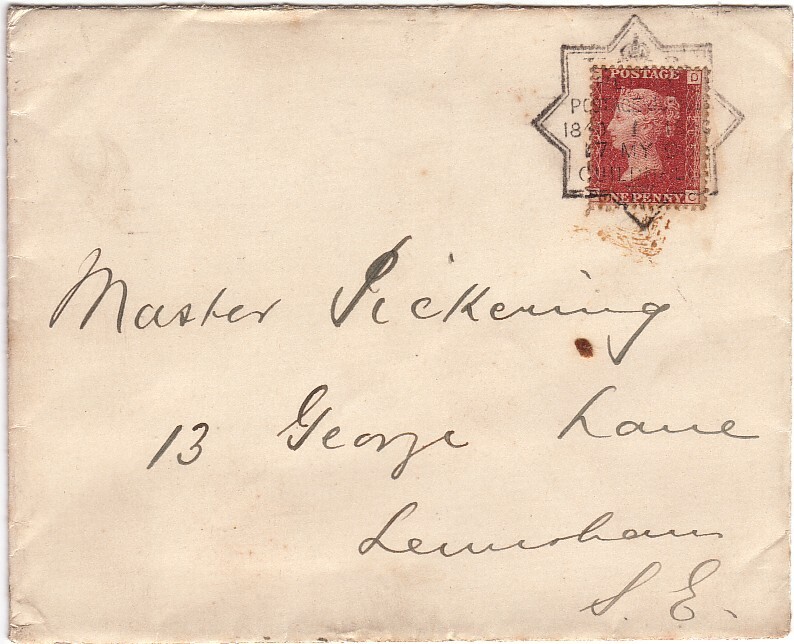 A rarity: addressed to one of the Post Office VIP's at the opening of the Exhibition. and unusually with the smaller date stamp on the top flap. Mounted on brown card and flanked by two other strikes from the Exhibition. 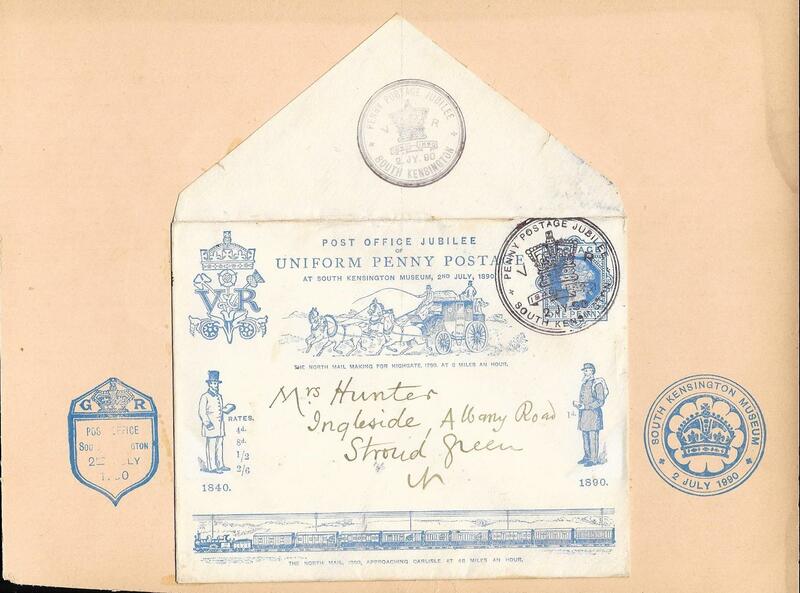 Envelope addressed to Mr Hunter's wife and probably written by him. 151598. 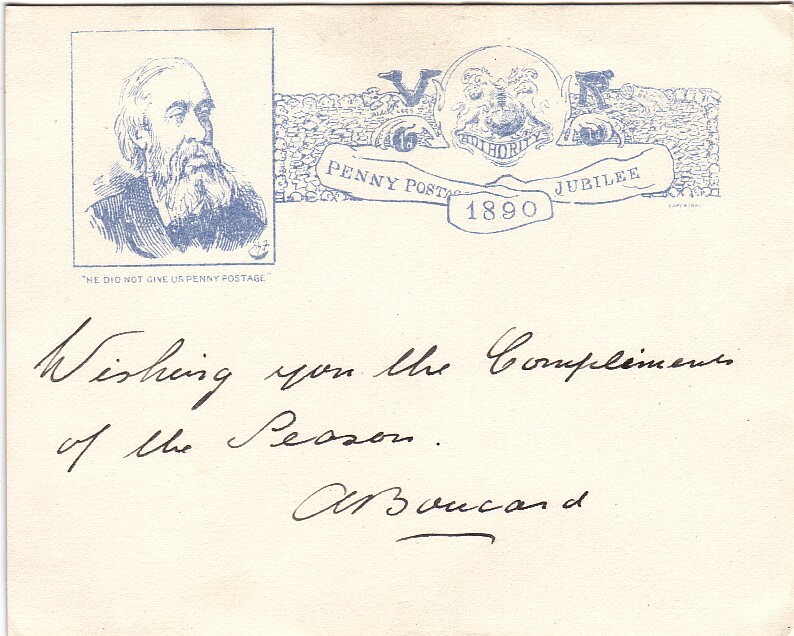 The May 1890 Special Exhibition postcard, used on the last day of the Exhibition and sent to Mr Hunter. W H PREECE, Chief Electrician of the Post Office. that was more than 10 years ago and not sent to a Post Office VIP. Mr A Hunter's contribution at the May 1890 Exhibition. 'The Penny Postage Jubilee 1890' publication by Werner Bauschke and illustrated above. asking if this lecture had been published and requesting a copy if it had. 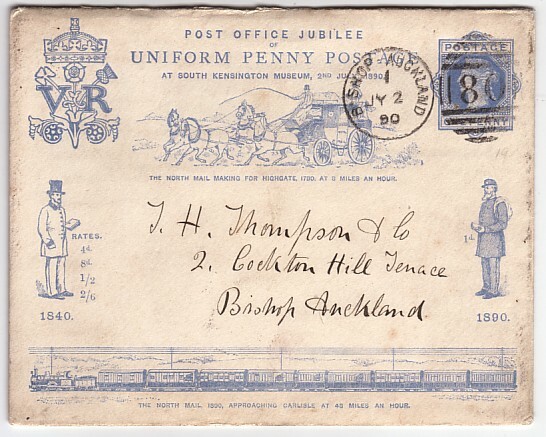 figures quoted for the growth in mail since Hill's Uniform Penny Post. 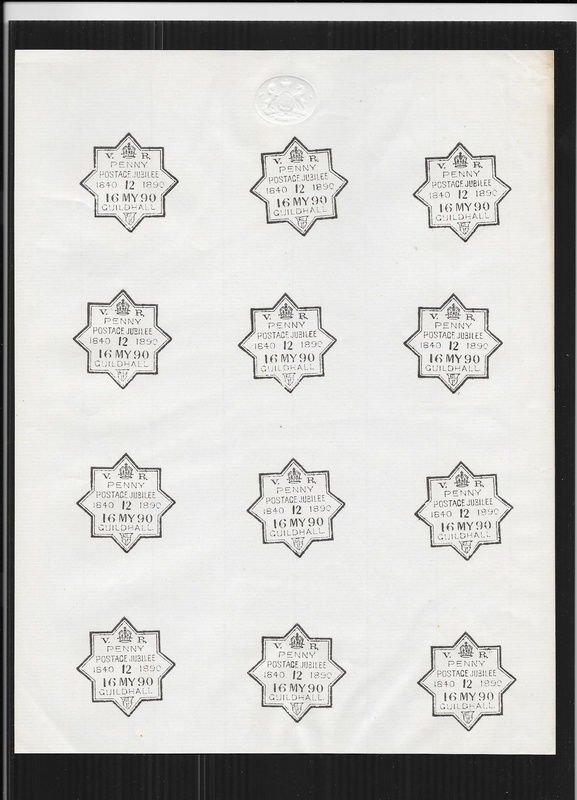 The Archer perforation machine is mentioned as is the international growth in the use of 'these postage labels'. 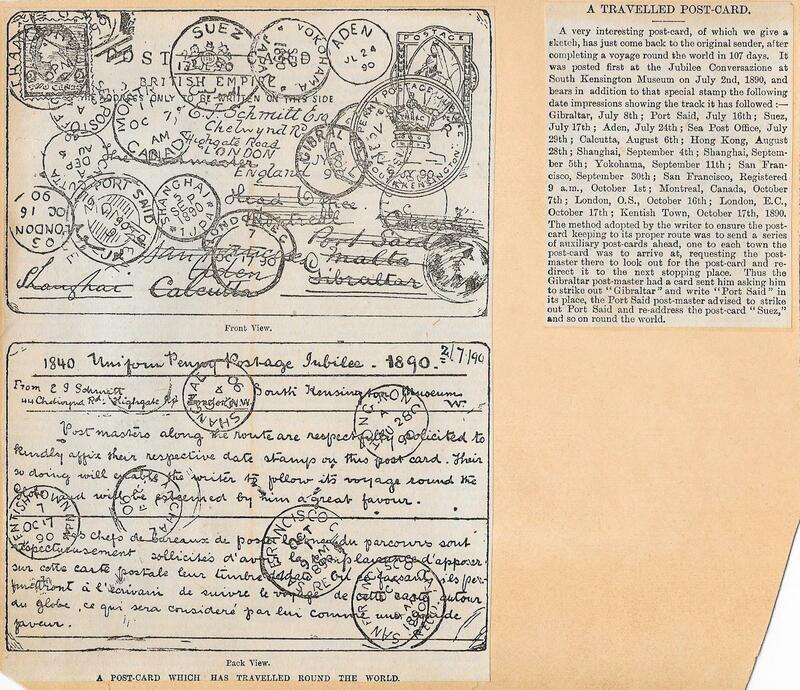 'Foreign and Colonial Parcels' with a mention of Mr A Hunter, the Chief Superintendent of the Parcel Post. 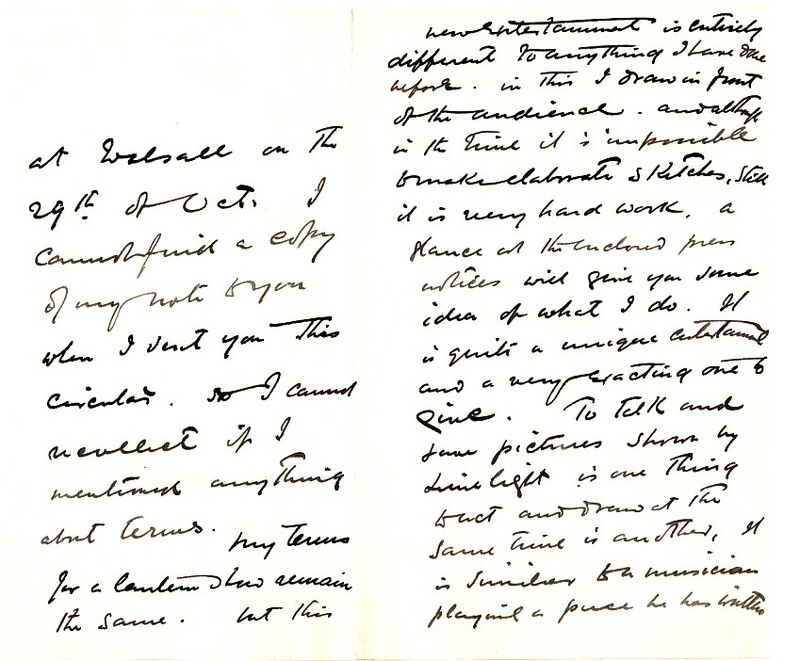 written at the time of his retirement. and the various contributions he made to the Post Office. A remarkable and unique grouping that would form an interesting, memorable and outstanding display. and the two Tube Post cancellations flanking them. at the printers as a mock up for approval by the Post Office? Card with all SIX cancellations in use at the July 2nd Exhibition. 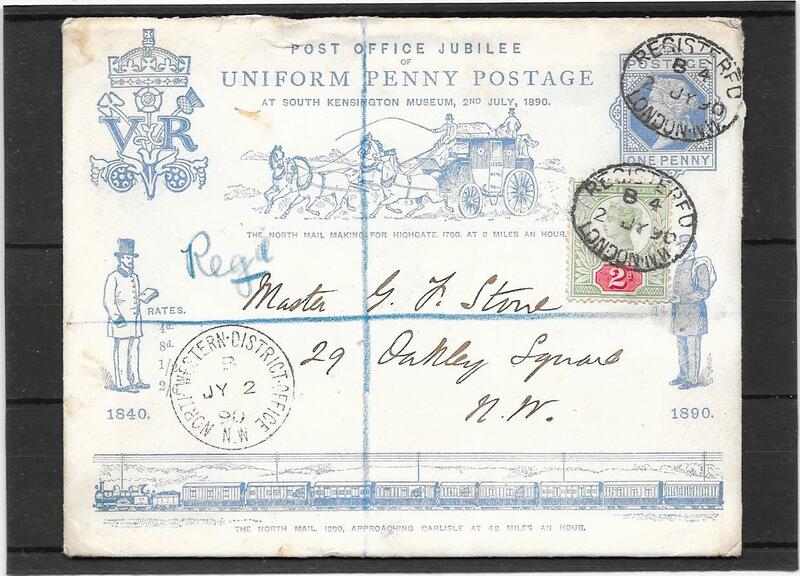 available at the July 2nd 1890 Exhibition including two strikes of the scarcer smaller circular date stamp. NB: the image has been cropped to remove staining at the top and right side: the top strike is partially affected. flanked by two of the July 2nd Exhibition cancellations. An early trial of design? 151592. 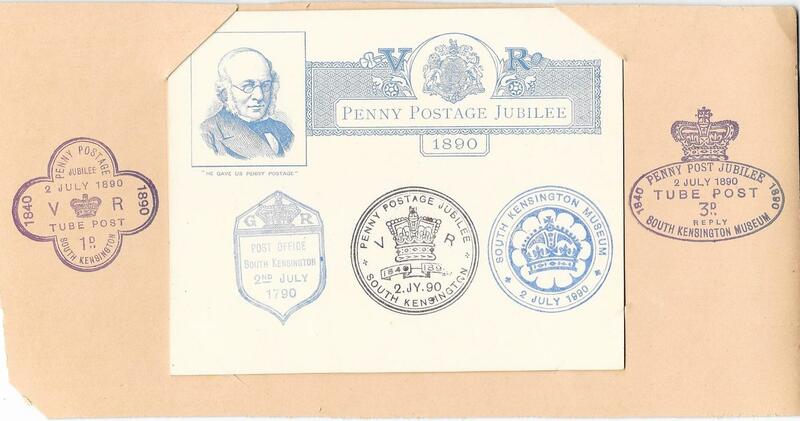 Mounted on card with a cut out sunken insert with the 1890 date for the Penny Postage Jubilee. Perhaps one of the early ideas produced by the printers? Have not seen this type before: may be a unique survivor. 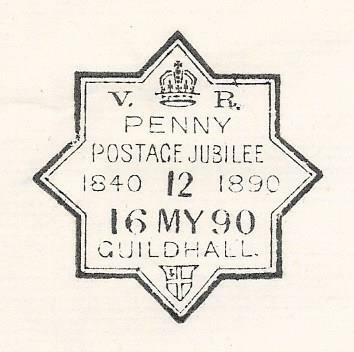 used on the First Day of the May 1890 Penny Postage Jubilee. 151593. A notice re the event at the Guildhall in aid of the Rowland Hill Benevolent Fund. 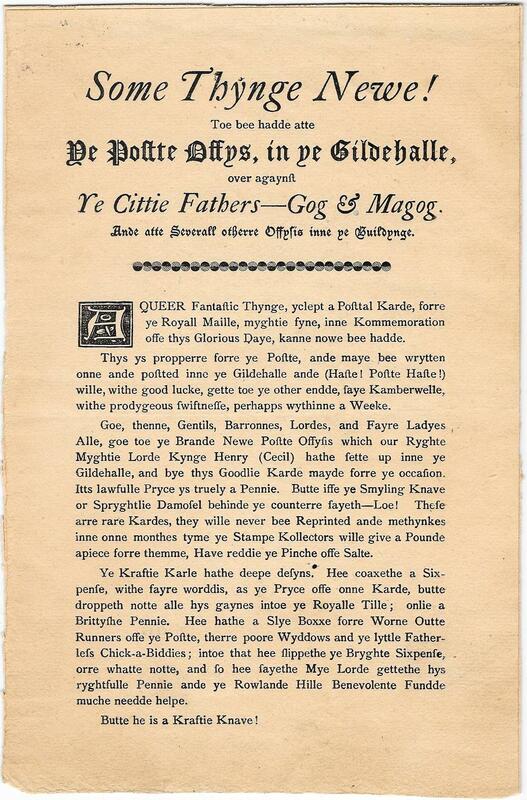 Apparently written in Olde English by F E Baines to advertise the event. 151594. Cut outs from an original newspaper published in October/November 1890.
to arrive at its destination back in London on October 17th 1890. 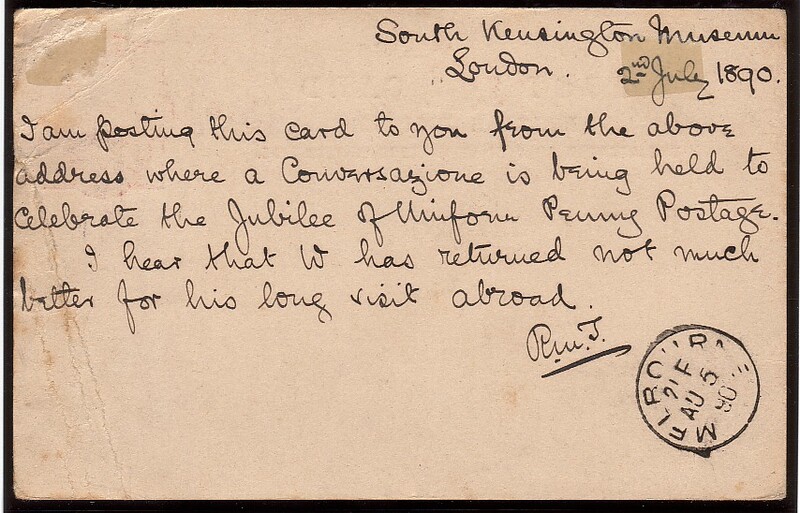 One wonders where is the original postcard and has it survived? 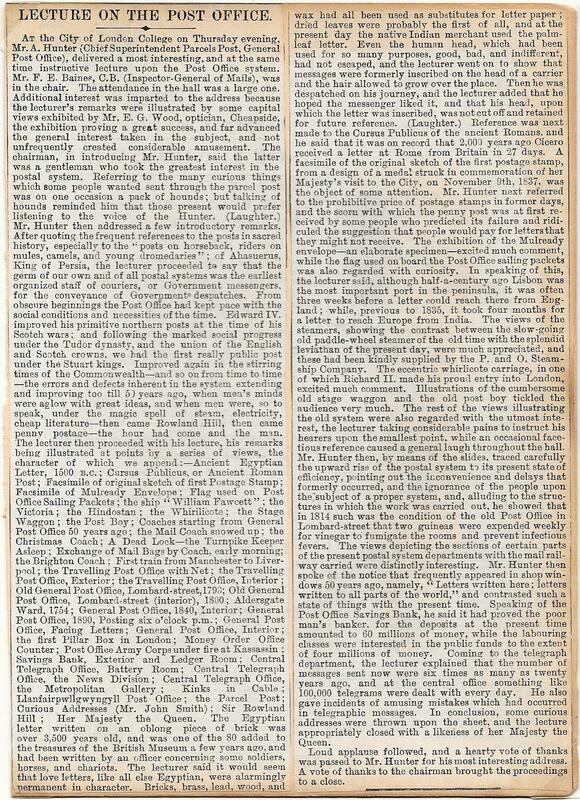 May 1890 Penny Post Exhibition. 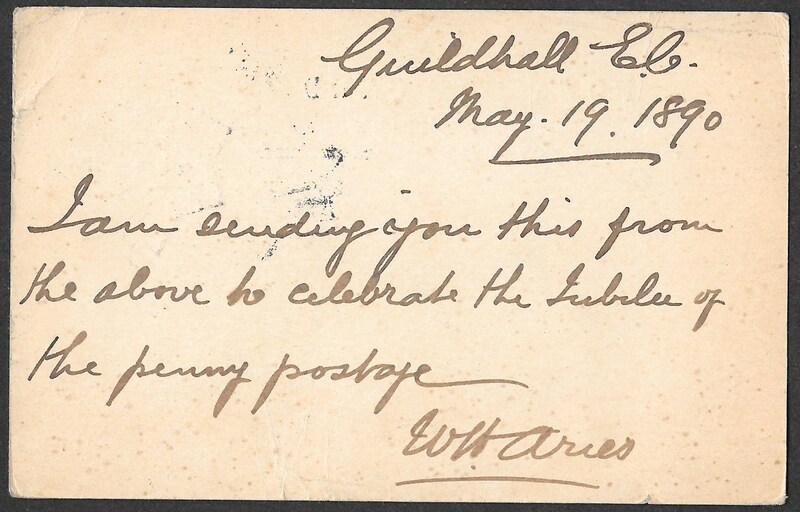 by the Guildhall Exhibition special date stamp for May 19th 1890 - the last day of this event. 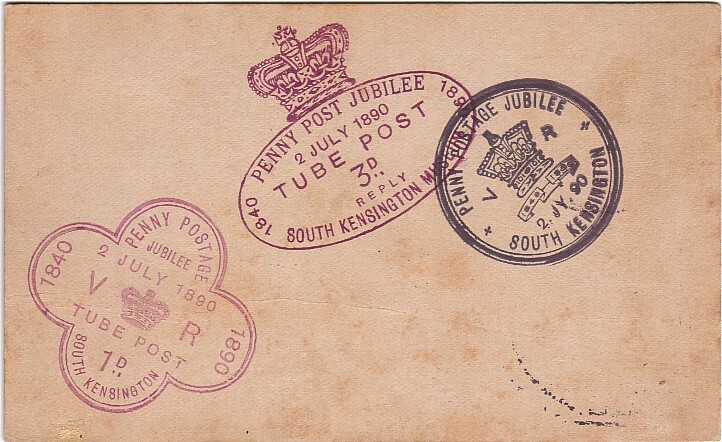 tied by the July 2nd 1890 Penny Post Jubilee Exhibition cancellation. 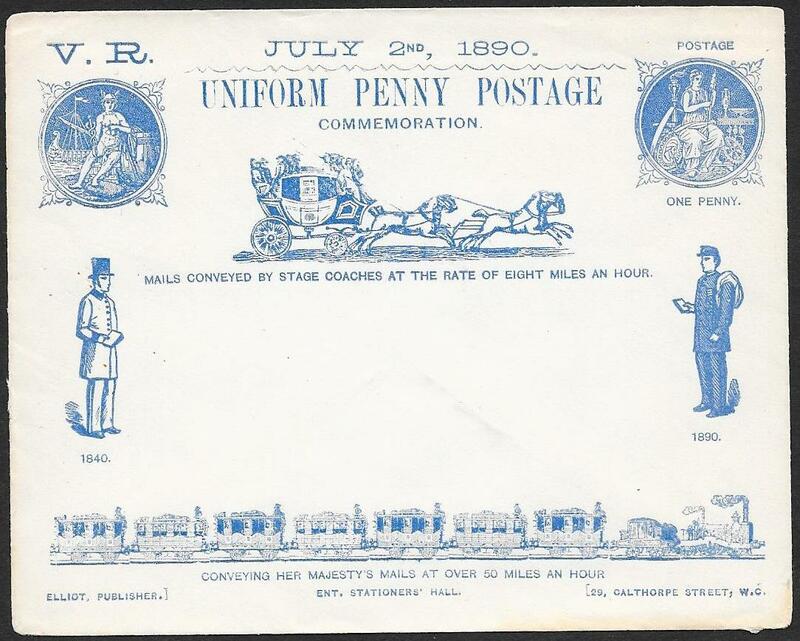 Sent locally with a July 3rd 1890 cds on the reverse. 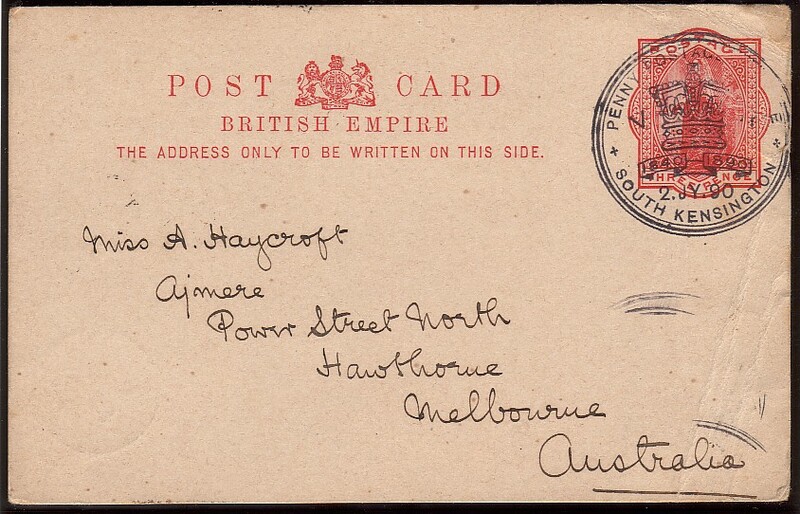 Extremely unusual usage and the first we have seen of an Australian stamp used in this way. NB: the browning around the stamp is NOT present - an effect of the scanner. 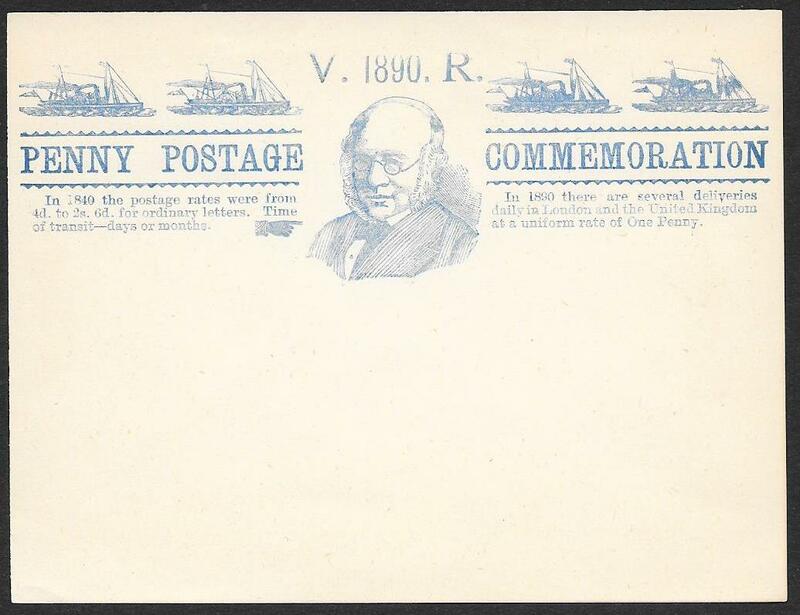 July 1840 wrapper re-used at the July 1890 Exhibition. 151252. Wrapper, side flaps removed for display, originally posted to the Guildhall on July 11th 1840. 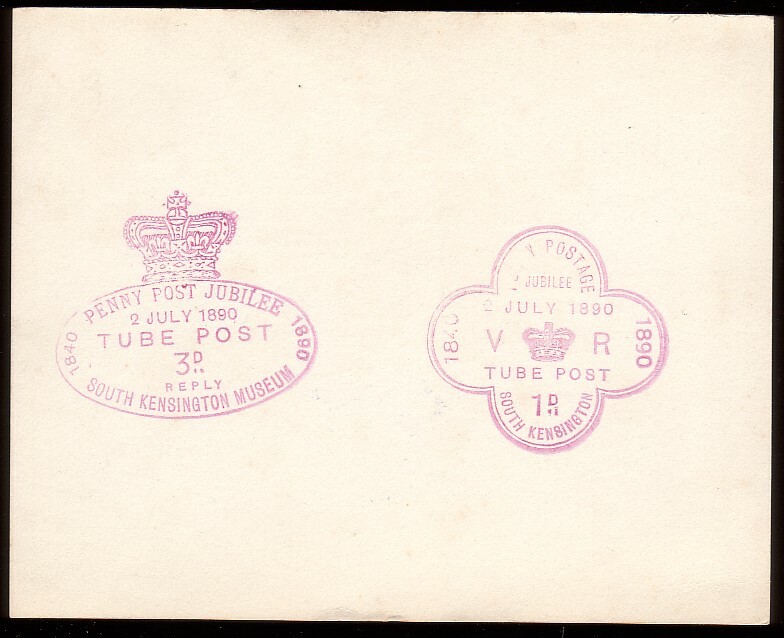 July 2nd 1890 Penny Postage Jubilee Exhibition and cancelled by the Special Exhibition date stamp. It was posted back to the Chamberlain's Office at the Guildhall. 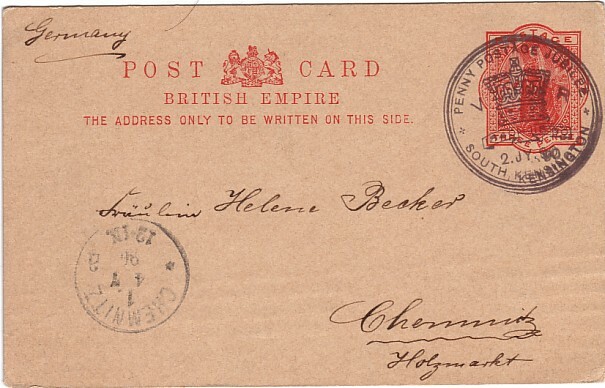 On the reverse is a fine and rare usage in red of the Hoster dater for July 3rd 1890. An attractive, remarkable and rare item from the Exhibition. Marginal PAIR SG201 used from the Exhibition. on July 2nd 1890 and cancelled by the Special Exhibition cds. 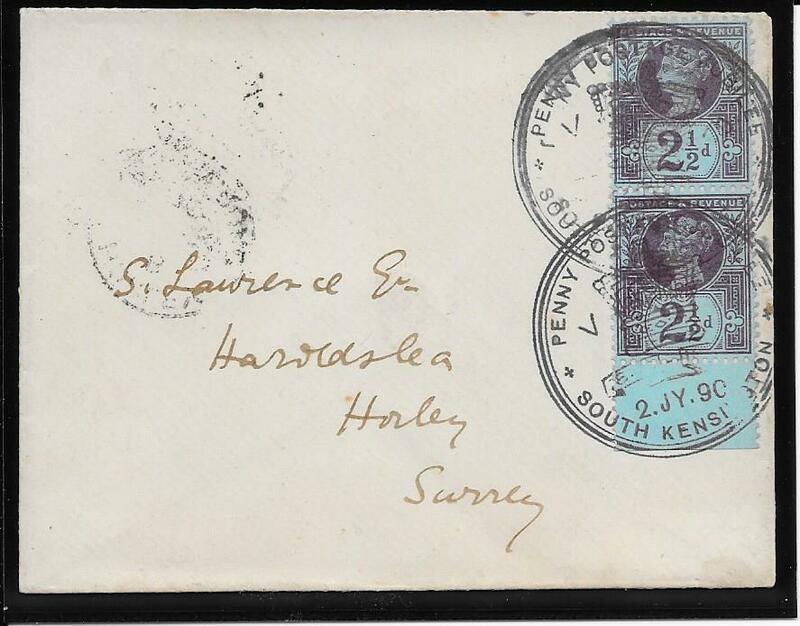 Sent to Horley, Surrey, and with Horley cds on the reverse for July 3rd 1890. The envelope is in exceptional condition. 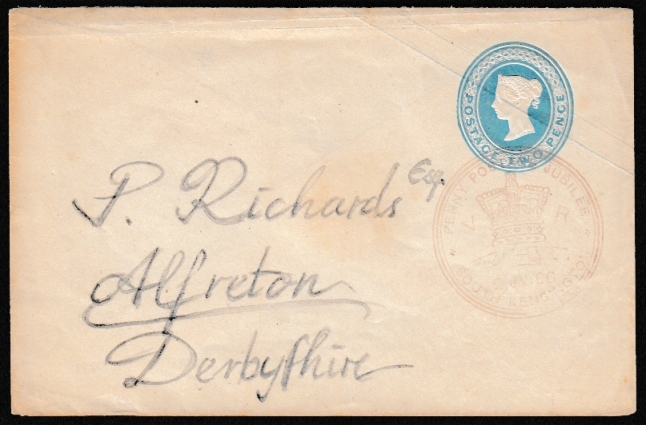 Very scarce to find envelopes that were posted at the Exhibition with other than a 1d value. The stamps were from the earlier printings with no Jubilee lines in the margins. Rare: 1d Plate 179 sent from the Exhibition. 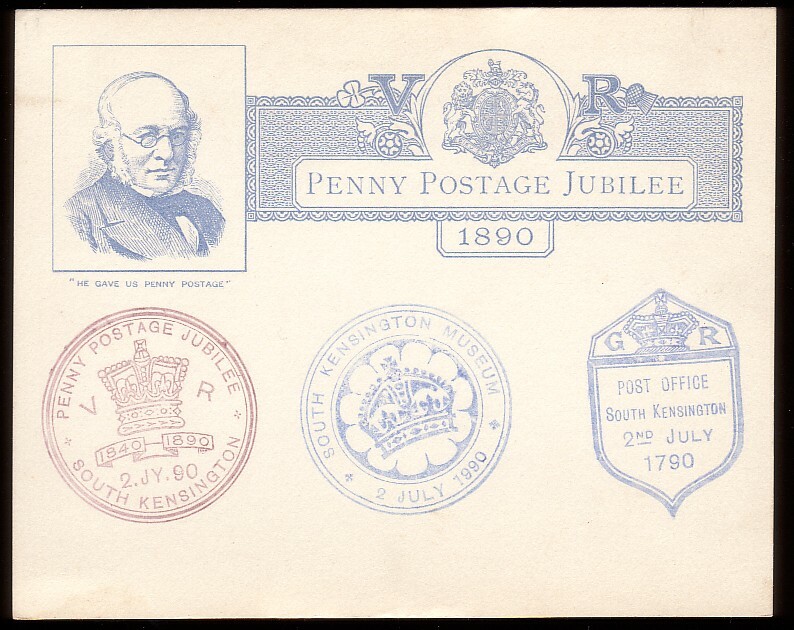 tied by the July 2nd 1890 Penny Post Jubilee special cancellation. On reverse is a red cds for July 3rd 1890.
from The Exhibition rather than cancelled to favour. It itself is worthy of being on display in a stamp Exhibition! Rare to find in such superb condition. NB: The few age spots are nowhere near as pronounced as the scanner suggests. The colour of the 1d is much richer than the scan shows. 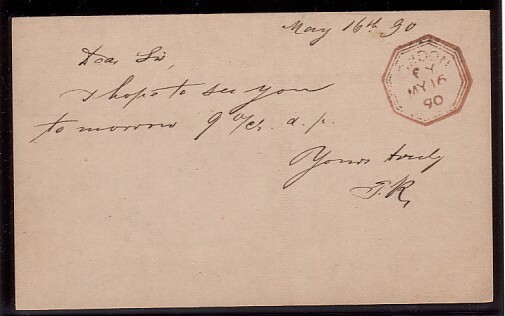 Rare: 1841 2d Embossed Envelope sent from the Exhibition. 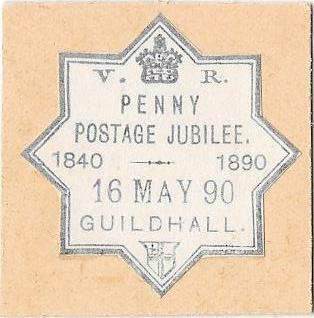 May 16th 1890, of the Penny Post Jubilee Exhibition held at The Guildhall. This handstamp was designed specifically for cancelling mail but this item was not posted. 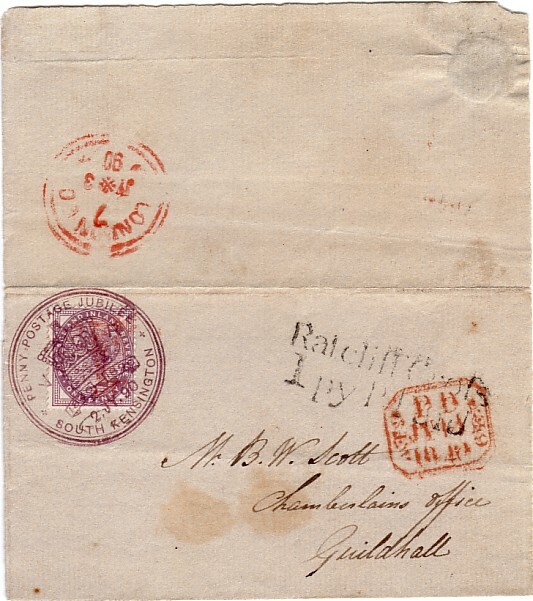 the 1841 envelope, so cancelled at the Exhibition, is RARE and the first we have seen. The South Kensington Museum on July 2nd 1890. The envelope was addressed but not posted. 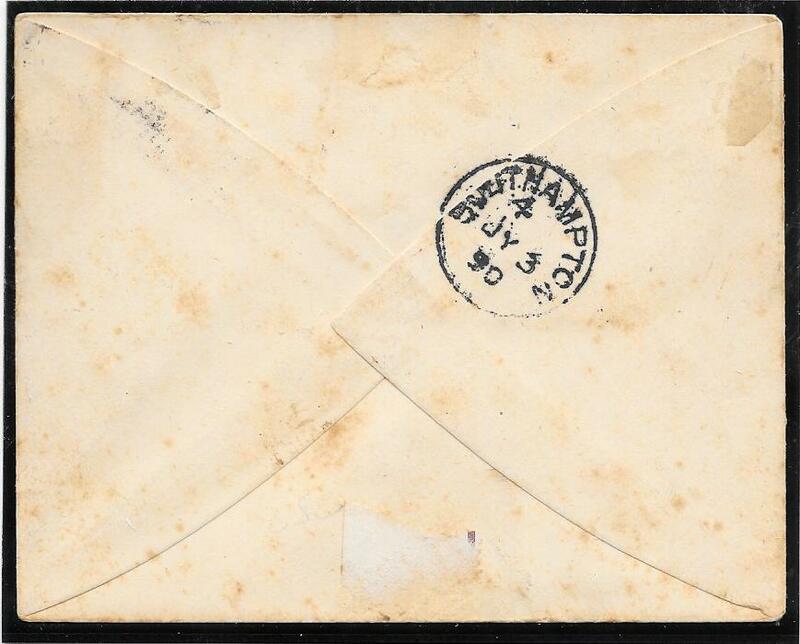 The only example we have seen of this 1841 envelope used in this way. A RARE item despite the light cancellation and in better condition than the scan suggests. 1073. 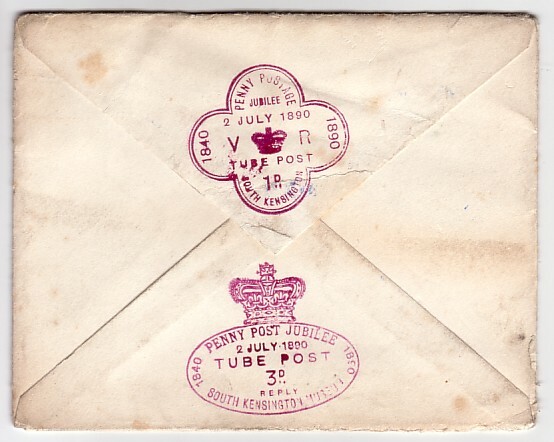 July 1890 Harry Furniss mint caricature of the Post Office Jubilee envelope with insert. 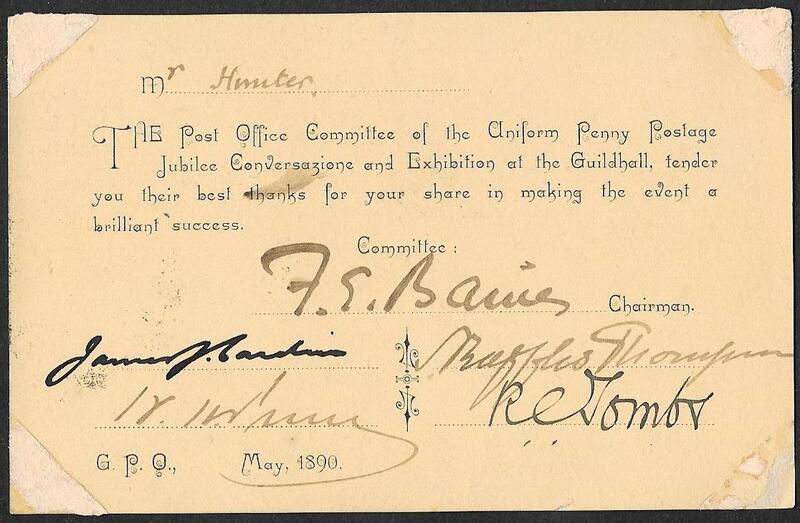 on the FIRST DAY of the Guildhall Exhibition, MAY 16th 1890 .
and NOT items sent though the post. 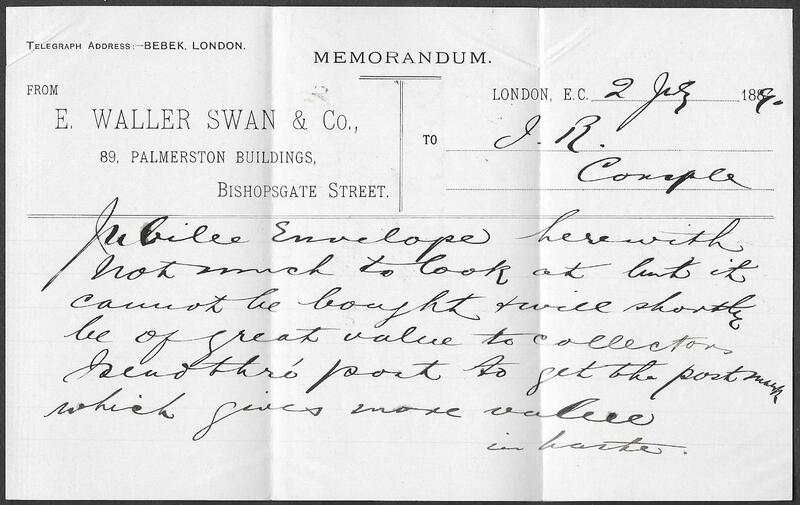 However in this example the card was cancelled by Favour then and posted to a London address. for the first day of the Exhibition, May 16th 1890. We have previously not seen this cancellation used as a transit mark. A rare/unique combination of features. Metal Handstamp on the First Day, May 16th 1890, with a code 8 indicating 8pm. The supply of these cards was exhausted at 10pm and then ordinary cards were issued. RARE usage from IRELAND on the DAY of ISSUE. 1/2d SG197 tied ‘172’ numeral in bars of Londonderry. and the first we have been able to offer. NB: The browning at the top, sides and in the centre is an effect of the scanner. RARE usage of THREE of the EXhibition Cancels posted to SCOTLAND. 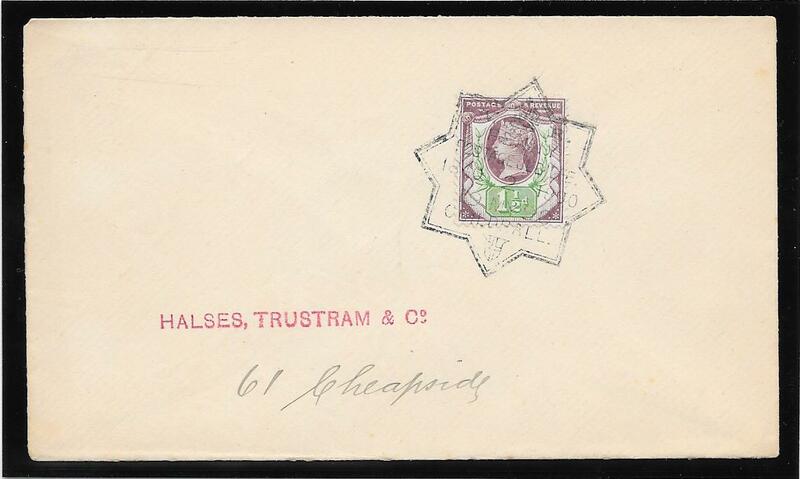 from the Exhibition to Broughty Ferry, Scotland with a Dundee cds on reverse for July 3rd 1890.
cachet struck in the scarcer purple; an unusual usage as such. NB: The browning at the top, sides and the centre is an effect of the scanner. 1d Plate 205: rare usage at the Exhibition. with a London cds in red on the reverse for this same date. Very scarce usage of this 1d issue. RARE usage: 1d lilac BISECT at the Exhibition. 15053. 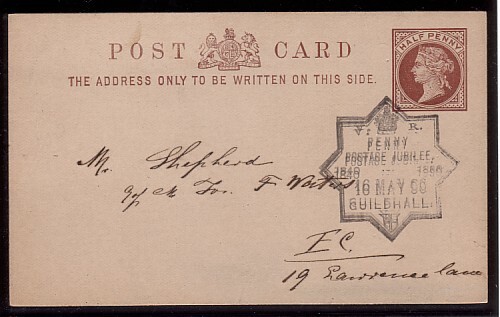 July 2 1890: Superb UPU 2d brown postcard sent to Stoke Newington from the Exhibition. London red cds on reverse for July 3rd 1890 and a two word message only – ‘My Mother’ . A bisected 1d lilac added making the postage two pence halfpenny. The only bisected 1d used from the Exhibition we have seen. Rare item in superb condition. FIVE of the Exhibition Cancellations on the Commemorative Envelope. used at the Exhibition, three on the front and two on the reverse. Some age marks but NOT as pronounced as the scan suggests. the two on the reverse are unusually finely struck for these. 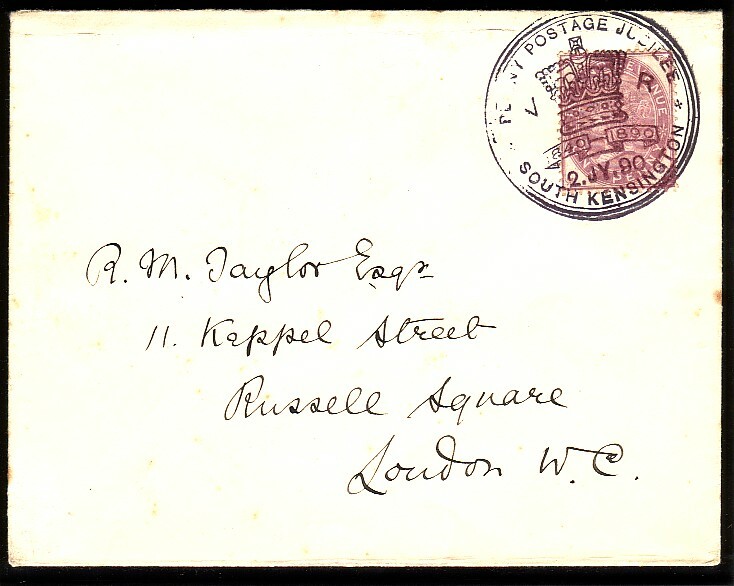 Scarce to find five on the same envelope and especially so neatly applied and arranged. 15058. 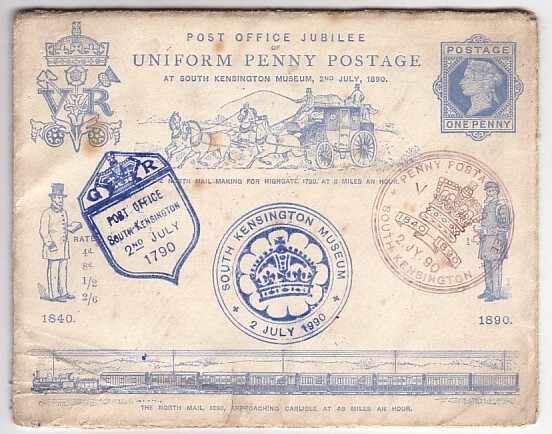 1d plate 199, tied to piece by the July 2nd 1890 Penny Post Jubilee Exhibition date stamp. Scarce usage of a 1d plate number at the Exhibition. 1/2d blue SG187 tied by a single strike of the special handstamp in blackish violet ink. London WC July 3 1890 cds on reverse. this one. Exceptional and a rare opportunity to acquire such an item. the last day of the German Exhibition, October 10 1891, and by the Royal Naval Exhibition cancel for October 19 1891. Envelope with some peripheral faults and age spots but a good example and scarce.